Here I am, back in the office –but still listening to Stone Roses MP3s. Christ, why can’t I stop?! This time last week, I was rising from a hotel bed in Cairo, still deathly ill with God-knows-what virus. I arrived in Canada with a nasty head and chest cold. Historically, my colds last weeks and sometimes months, so I was afraid I was in for a long period of torment. But this time around, I tried three things differently: (i) I limited my caloric intake during the period of sickness; (ii) I started the practice of nasal/sinus irrigation; and (iii) I took ColdFX religiously. Would you believe it? My cold was completely gone within 48 hours! I’m typically not a great believer in herbal or home remedies for colds. But so far, I’m pretty impressed by ColdFX, which is just a particular concoction of ginseng. The science, though, is still questionable. 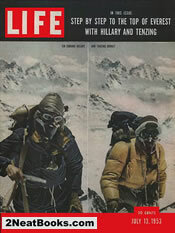 In more important news, I was saddened to hear of the death of Sir Edmund Hillary. Sir Edmund was a giant among adventurers, ranking in my eyes on par with Magellan and above Neil Armstrong. It is one thing to have conquered Everest, it’s another to have done so with the humility that Sir Edmund displayed. Moreover, his vision subtended more than just the mountain; he recognized the plight of the Sherpa people and their right to much of his glory, hence his early refusal to share with the world which of the two men –himself or Sherpa Tenzing Norgay– was the first to summit. History has since recorded that Sir Edmund was first to the top, but he could not have done it without Norgay, who, despite falling into alcoholism after his triumph, remained a transcendant hero in the eyes of Sherpas, Nepalese and Indians alike. Sir Edmund committed his fortune, the remainder of his years and all of his fame and influence to improving the lives of the Sherpas, building schools and an airstrip for the previously isolated and underprivileged community. Tragedy struck him during his charitable years, taking his wife and daughter in a plane crash, yet he persevered. Sir Edmund was very much a hero of the classical Imperial old age, a giving and self-sacrificing gentleman. I’d always hoped to meet him. My retired grade 9 English teacher managed to meet him at the Everest base camp 2 years ago, as I reported here. On my wall still hangs a framed cover of a 1953 copy of Life Magazine, showing Sir Edmund and Tenzing on the summit of Everest. It remains an example of how individual triumph can be had with dignity and humility, and can be transformed into a life of philanthropy and social reward. Rest in peace, Sir Edmund.